Saturdays forecast suggested an early start, heavier rain was predicted for later on in the day. For most it drizzled with no views when it wasn't tipping down. Fiona M cycled into the remote Corbett Aonach Buidhe on an excellent track but the miserable weather dissuaded her from adding on an extra peak. Alison C, Keeny, Nigel and Alan R went Graham ticking up Druim Fada whilst Richard went up the nearby Corbetts of Beinn na h-Eaglaise and Beinn na Caorach. Alan S, Margaret and Fiona C attempted to avoid a soaking by doing a low level circuit near Dornie... it didnt work and they still got wet. Mike and Fiona opted for the unique double corbetts of Buidhe Bheinn and Sgurr a'Bhac Chaolais. Despite getting lost (200m extra ascent and extra km in the clag was required to relocate the ridge!) and soaked on the connecting ridge they got one cloud free summit and returned to the car mostly dry (honestly!). 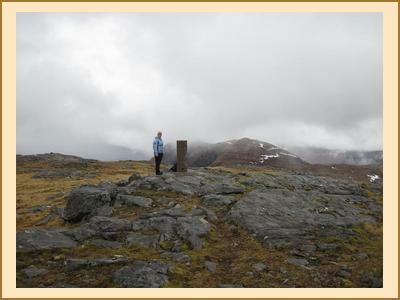 Meanwhile Gillian got closer to finishing the corbetts by ticking off Glamaig on Skye. Bruce and Alison W went up Am Bathach and Ciste Dubh. The remaining members had a car free day straight from the hostel. Harry opted for A' Ghlass Beinn whilst Sara and Pete did a circuit of Beinn Fhada and A' Ghlass Beinn. A damp day for all and the drying room was pushed over the edge! Sundays forecast wasn't much better. With a hint of drier conditions to the east Mike and Fiona had an easy and almost dry ascent of Beinn Loinne which ended being cloud free with some nice views of the surrounding hills. Just as well as the expected fire wasn't on in the Cluanie Inn. Alan S, Margaret and Fiona C were across the road on An Bathach. 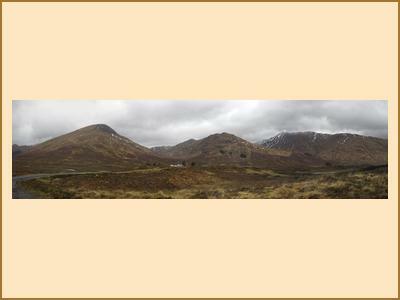 Keeny and Alison chose the Corbett Sgurr an Airgid handily situated across from the hostel. Pete and Sara continued on their Munro mission on a damp circuit of Carn Ghluasaid, Sgurr an Conbhairean and Sail Chaorainn. Nigel and Richard headed off east as well. Nigel had a dry day on Carn Mhic an Toisich with the bonus of a hut, another Graham bagged and a copy of the Daily Star to read whilst he relaxed in the hut, bonus! Richard wasn't so fortunate with a wet day on Meall Dubh. With less members staying on the Sunday and the discovery of the humidity settings the drying room almost coped. Monday started along the same lines of the other days with low cloud and more drizzle. Those hills that were visible had a hint of snow on them and the cloud did seem to show signs of shifting. Kenny and Alison went south and found some Grahams in pleasant weather. Fiona and Mike sweated their way up the local Corbett Sgurr Mhic Bharraich to be rewarded with great summit views and no rain. Gillian and Margaret were obviously tempted by the hut and Daily Star by an ascent of Carn Mhic an Toisich. Richard went up Am Bathach with Nigel heading for the nearby Graham of Meall A'Chrathaich which was bathed in sunshine. Sara and Petes car was spotted in a layby at Drumochter no doubt on a mission to go up Carn na Caim and A'Bhuidheanach Bheag. The weather looked good as we drove by. Despite the best efforts of the weather it was an enjoyable and sociable weekend.